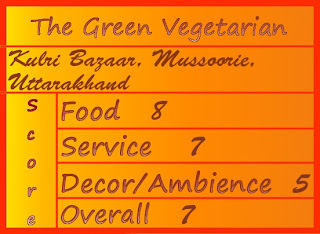 The Chomp Files - Where To Eat,What To Eat: Casa Mia and The Green Vegetarian,Mussoorie - Simply Fahad-istic! Vegetarians who like their desserts without eggs,can choose from a range of eggless,fresh,almost melt in mouth pastries at this eatery.There is Eggless Black Forest Cake Slice,Eggless Butter Scotch Pastries,Eggless Strawberry Cream Cake Slices and an eggless version of chocolate truffle pastries too! Swearing to myself not even to think about food for next many hours,I walked on The Mall Road,back to the hotel I was staying at.The Indian dinner had me stuffed and I hoped that this after-meal walk would aid digestion.Weather was pleasant,as it usually is at this time of the year,and even though the road was crowded with tourists,their presence made me feel strangely comforted. I saw the board that read 'Casa Mia',and my feet refused to move any further,my mind dismissing the recent decision about food.Before I knew,I was greedily ordering takeaway desserts. Casa Mia,the little take away/bakery(Their board says Bakery,Cafe,Deli,Pizza) I fell in love with the last time I was in Mussoorie,had not changed much in the past seven years.So many years later,I still remembered their soft Chicken Sandwiches,with creamy filling.Now,not only because I have a huge sweet tooth,not only because I believe in the philosophy of “Life is uncertain.Eat dessert first.”(Thank you Ernestine Ulmer!) ,but also because I wanted to explore much more of this eatery's food this time,I was happy getting my sweet course. 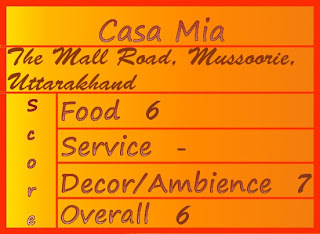 An indulgent take away - Tiramisu from Casa Mia!Priced at Rs. 65,soft sponge cake is layered with luscious,sweet,creamy frosting.The coffee flavor in this Italian dessert is neither too strong,nor too weak - Just perfect! Another take away from Casa Mia,this Fruit Cream is recommended!Fresh fruits - apple,banana,mango and papaya combined with sweetened cream and topped with a spoonful of jelly for more flavor!I guess the fruits change from season to season depending upon availability though.Priced at Rs. 60. Apart from these two very delicious desserts,you may also like to try their Chocolate Feast,a combination of two sponges,different flavors,covered with chocolate ganache. If there ever can be a single word to describe Casa Mia,I would say 'Variety'.They have a variety of pastries.When it comes to dry cakes,they have a variety of muffins - Chocolate Chip,Blueberry,Raisin to name a few.When it comes to savories,they have a variety of patties.I particularly recommend the Mushroom one - hot,crisp puff pastry stuffed with sautéed mushrooms,onions and capsicum.Lip smacking!On the other hand,Cheese Patties,with meager processed cheese interior are avoidable. Non vegetarians,the Chicken Sandwich as mentioned earlier,is a good option. In the recent past,they have introduced shakes and Cold Coffee,but unless you are desperately thirsty,they are passable. 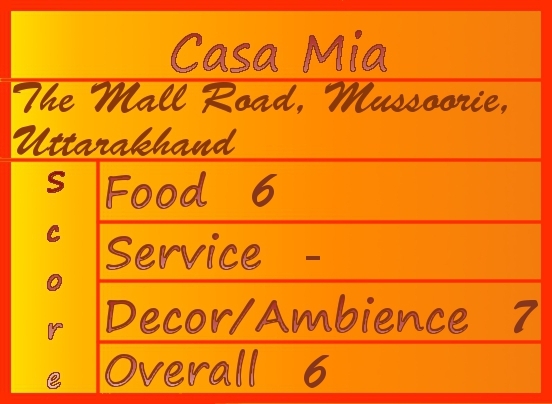 With this recent trip to Mussoorie,I did discover more of Casa Mia's fare.Most was good,some was not-so-good.Hungry tourists and locals are seen hogging here.Even if you are not really hungry,go,have a bite! Probably the best part about this city's gastronomical landscape is,a lot of fine eateries are a stone's throw from each other.Begin walking from Casa Mia,and five minutes later you are at Chick Chocolate .Take a few steps further to reach The Green Vegetarian in exactly the same time. If chaat and hot Indian snacks are what your heart desires in cool weather,The Green Vegetarian is the place for you!Do not miss their Chinese Samosa,the crust is thicker and flakier than that of conventional samosa,filled with moist,spicy mashed potatoes,green peas and cubes of soft paneer(Cottage cheese) .Served with saunth and hari chutney,it is a rich,but heavenly treat! What can I say about a restaurant that makes every vegetarian proud and every non vegetarian believe that with food like this vegetarianism is a cake-walk?It is a foodie's delight despite being overcrowded during dinner hours! You can go inside and have a full meal or try their sumptuous snacks standing outside - Tikki ,Veg Kabab,Veg Springroll,Sabut Dana Roll,Chinese Samosa,Kathal Pakora(Jackfruit dipped in spiced bengal gram flour batter and deep fried to make crisp on the outside,tender inside fritters.) ,Tiranga Paneer(Unsalted fresh Indian cheese,Paneer,cooked to a tricolor preparation.) and Paneer Pakora(Unsalted fresh Indian cheese,Paneer, dipped in spiced bengal gram flour batter and deep fried to make crisp on the outside,soft,squishy inside fritters.) . One cook prepares bhaturas(Fluffy,puffy and golden North Indian bread made with a leavened,refined flour and curd/yogurt dough.It is deep fried and almost always served with chole,the spicy,curried chickpea/garbanzo bean preparation.) while the other fries them in a large kadhai. For breakfast,whether you have Chole Bhature or chatpate Parathe('Chatpate' means spicy,'Parathe' is plural of Paratha,the shallow fried Indian bread usually made with wheat flour and often stuffed with a variety of fillings.) ,I recommend a glass of Lassi(Sweet or salty yogurt drink) along to celebrate full Indian experience. Even though only vegetarian,The Green Vegetarian boasts of one of the largest menus for lunch and dinner.While the night was rainy and cold,I was digging in some delicious Handi Paneer with hot,just-out-of-the-tandoor Onion Kulchas.There was Raita Boondi by the side,and some fabulous Indian Mixed Pickle.What else can one want? Not only food,but service is one of the biggest strengths of this restaurant too!No matter how crowded,your order is delivered on the table super fast! For a restaurant with huge menu,where every preparation tastes so good,it is difficult to pick up favorites!All I will say is,no matter what the choice,you will not go wrong! 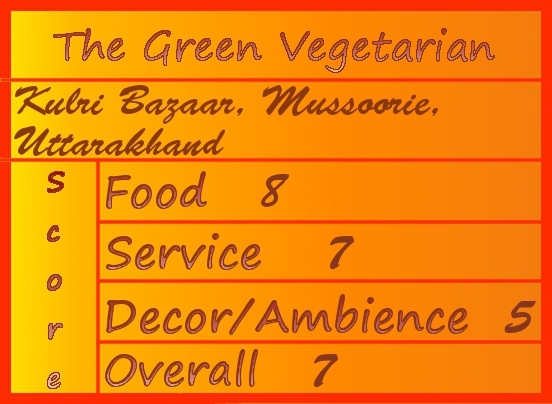 The Green Vegetarian has to be the best eatery I visited in Mussoorie!You know,you should not be missing out on this one! All property/entity i.e. restaurant/dhaba/streetfood/takeaway reviews on Simply Fahad-istic! express only the blog author's opinions and are strictly for educational purposes only.They are not to be considered endorsements or warnings for/against purchasing the products or services of these properties/entities.Since there have been no discussions with the owners of these properties/entities,no kitchen or back of the house visits,assumptions have been made about some situations pertaining to operating procedures and may not necessarily be true.Menu prices mentioned are of the time of the reviews and are subject to change.These reviews are not paid for by the property/entity owners and are a result of anonymous visit(s). Lovely food and places! Those sweet treats look quite tempting. thanks for sharing fahad. whenever i visit mussoorie will surely try these places. Enjoyed reading this one. I'll definitely visit these eateries whenever I visit Mussoorie next time.